“CONSULT us, don’t insult us,” is the message of West Belfast residents to Social Development Minister Margaret Ritchie after further SDLP mismanagement was exposed during a public meeting regarding the redevelopment of the former barracks site in west Belfast. Residents expressed their outrage during the meeting after a plan to curtail community involvement in the decision-making process was exposed by Sinn Féin. The plan came to light just days earlier with news of the establishment of a steering group brought together to implement a new set of Department of Social Development (DSD) proposals. Margaret Ritchie has already been forced to back down once after residents rejected an earlier attempt to hand over the former Andersonstown Barracks site to a private developer. The Carvill Group withdrew its proposal after public outrage at the lack of consultation. This gave the DSD minister a chance to think again. Still reeling from public criticism, the minister had promised to “think carefully” before making any further decisions and “contact the local community in the immediate future”. But months had passed without any attempt at a proper engagement by the DSD with local residents and then news of another DSD executive decision began to surface. Speaking after the meeting, local Sinn Féin MLA Paul Maskey pointed out that gifting the site to the local community would allow the full value of the land to be realised for the benefit of local people. After the collapse of the DSD initial proposal, Sinn Féin called on Margaret Ritchie to support a community-based consultation process about the future use of the former barracks site to be carried out by the West Belfast Partnership Board, a body funded by her own department. Sinn Féin further proposed that the DSD provides technical assistance to enable the Partnership Board to carry out that work. “There was no response from Margaret Ritchie,” Paul Maskey said. Then, earlier this month, documents released by the DSD announced that development of the barracks site was to be subsumed within the wider Andersonstown Gateway Project, a new scheme to generate ideas for commercial development. Commercial development is only one of four areas of DSD responsibility. Margaret Ritchie’s department also has responsibility for social development projects, the most widely supported option for the regeneration of the Andersonstown Barracks site. “The last DSD proposal collapsed in the face of public opinion,” Paul Maskey said. “Having already been badly stung, it might be reasonable to expect that Margaret Ritchie might be reluctant to make the same mistake twice. But apparently not. The decision to incorporate the redevelopment of the barracks site within a larger commercial development project suggests that Margaret Ritchie, far from responding to local opinion as she had promised, appears intent upon imposing another commercial solution. Furthermore, the DSD proposed a restricted consultation process that disenfranchised most of the local Sinn Féin electorate from the decision-making process. In what only can be described as a form of gerrymandering, the DSD presented a map depicting their proposed area of consultation. “The map only included 75 households out of a possible 1,500 in the vicinity of the site and it excluded areas where a number of residents’ groups had already expressed their interest in being consulted,” said Maskey. As a locally-based organisation already funded by the DSD, the West Belfast Partnership Board is best placed to carry out a community consultation process. But Margaret Ritchie appears intent on marginalising all aspects of local representation, including locally-based government bodies such as the Partnership Board. A few weeks ago, instead of appointing the local partnership board to carry out the consultation process, the DSD announced it had commissioned Deloitte Touche, a private consultancy. Worse still, the terms of reference drawn up by the department to instruct Deloitte reduced the consultation process to an exercise in public relations. The incorporation of the development of the Andersonstown Barracks site into the Gateway Project, with its emphasis on commercial development and resistance to any effective consultation process, suggests possibilities are being ring-fenced to promote a particular kind of option. In fact, the DSD is unequivocal in expressing its objective to restrict local input in the decision-making process. The terms of reference set by DSD outlining the kind of consultation process the department wants instructs Deloitte that “engagement of the community will focus people’s attention on options... and will not present them with a blank canvass”. It will be the private consultant’s job to persuade residents that “any decision to redevelop the site... will be justifiable by the results of the feasibility study”. That feasibility study is a separate piece of work and is about the creation of a “commercial hub” in the lower Andersonstown area. In other words, local people can say what they like: Margaret Ritchie has already decided. The only thing left for the DSD to do is to create a framework within which local people will be shepherded towards accepting it. “Why is Margaret Ritchie apparently so dead set against working with local people? 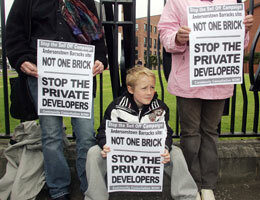 Why does the SDLP seem so determined to deny community development in the lower Andersonstown area? “Any attempt to disenfranchise local people, particularly where the vast majority of the electorate vote for a rival party (Sinn Féin), has to be regarded as suspicious.